Looking to jump start a career in web development? Seeking help in recalling an HTML tag? Just here to check out what all the fuss about HTML is about? Well, if your answer to any of these questions is in the affirmative, then you’ve come to the right place. As far as web development goes, it doesn’t get any more fundamental than HTML. The godfather of front-end languages, HTML still forms the basis of every web page you see around the internet. Thus, it stands to reason that if you want to get introduced and familiarized to world of web design, you must have a robust HTML cheat sheet at your disposal. By robust, we mean every important HTML tags, in addition to attributes for those tags, such as text formatting, lists, tables, forms etc. A good HTML cheat sheet isn’t exclusively useful to the beginner – even skilled and proficient HTML developers can find a use for it every now and then. That is why they should have a comprehensive HTML cheat sheet in their toolkit at all times. 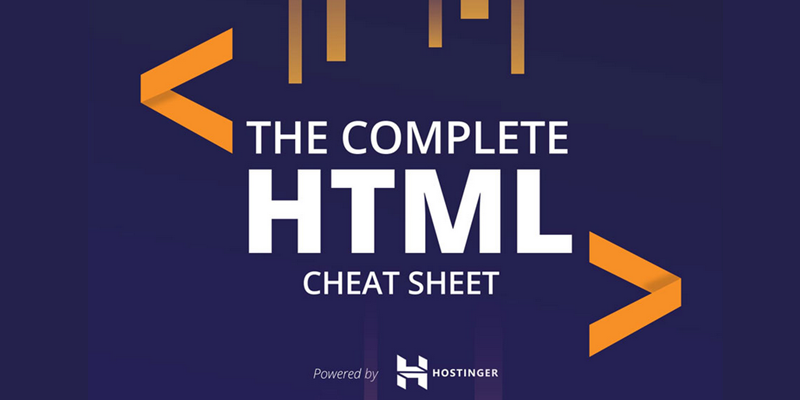 So, without additional delay, we present to you the definitive HTML cheat sheet by Hostinger. We hope it helps you in your web development journey. Below are the links for you to download the Cheat Sheet in two different formats: PDF and JPG (image). You can also view it online. If you have come this far, it means that you liked what you are reading (The Complete HTML Cheat Sheet).